I had read in two different natural dyeing books** that Stinging Nettle (Urtica dioica) could be used for dyeing and would produce a green yellow. 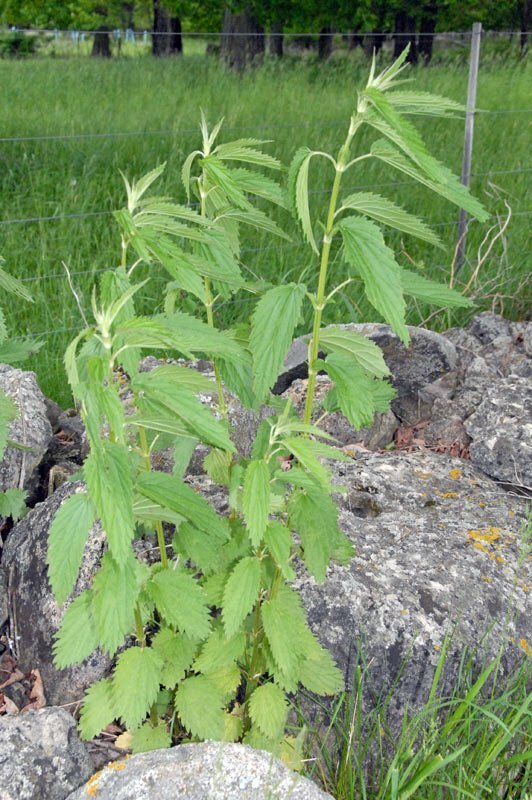 On June 2nd, the Stinging Nettle behind the barn and along the rock wall were about 12 -15 inches tall. I collected leaves and stems (wearing protective gloves to avoid the sting). In Jenny Dean’s book (referenced below), she mentions that the spring and early summer nettle gives a deeper color than the late summer and fall plants. I chopped the leaves and stems into pieces about 1 inch long, placed them in a fine mesh bag and soaked them overnight. I had 220 grams of dye material. Again, this week, I used four small skeins of yarn weighing 110 grams. I created the dye bath by simmering the materials for one hour. The dye bath was then separated into three batches. 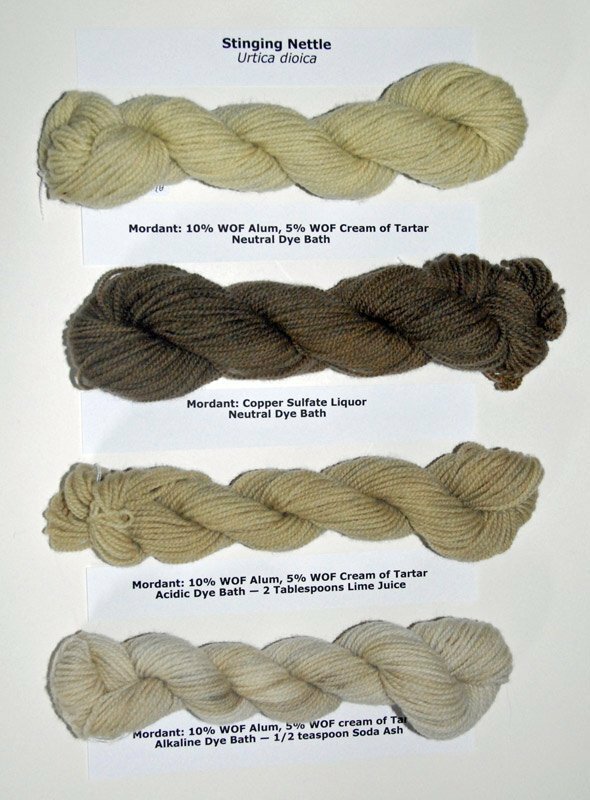 The neutral dye bath had one skein of Alum/Cream of Tarter mordanted yarn and one skein of Copper Sulfate mordanted yarn. The acidic dye bath with the 2 Tablespoons of Lime Juice and the alkaline dye bath with the 1/2 teaspoon of Soda Ash, each had one skein of Alum/Cream of Tarter mordanted yarn. The results are pictured below. I expected similar results to last week but was surprised when the acidic bath produced a darker shade than the alkaline bath. A reverse of last week’s results. I really liked the lovely shades of green-yellow and mossy green. Stinging Nettle will become a staple in my natural dyeing process beginning next year. **Using Stinging Nettle as a dye source is mentioned in “Wild Color, The Complete Guide to Making and Using Natural Dyes” by Jenny Dean and Karen Diadick Casselman, 1999 and in “Dye Plants and Dyeing, Plants and Gardens, Brooklyn Botanic Garden Record” 1980. Makes good soup too! Had it in Finland. Yes to Nettles soup. The color is quite pleasing though. I enjoy this tutorial about dying wool with natural plants.